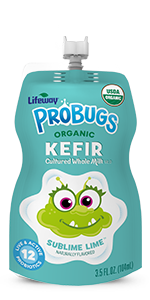 Made with organic ingredients and 1g of added sugar per ounce, Organic Lime ProBugs Whole Milk Kefir is the perfect go-to snack. This creamy kefir is high in protein and calcium and low in lactose. Each no-spill pouch has 12 live and active probiotic cultures to help support digestion. Organic Grade A Pasteurized Cultured Milk, Organic Cane Sugar, Organic Lime Extract, Organic Vanilla Flavor, Vitamin D3.